An unmanned aerial vehicle (UAV) that can take off vertically and manoeuvre around the tops of buildings has been proposed for security monitoring at the London Olympics. The concept and design for the aircraft is by VTOL Technologies, a small UK technology research and development firm based at SEEDA’s Reading Enterprise Hub. The single fixed-wing aircraft – dubbed Flying Wing – would lift off the ground with four thrust vectoring ducted-fan units. Ashley Bryant, managing director of VTOL Technologies, explained that once in the air, these units are designed to flip back, allowing the aircraft to fly forward at high speed. He added that the thrust can be controlled individually for each unit, giving the Flying Wing the ability to manoeuvre around tight spaces. These thrusters would also enable the aircraft to hover, launch from a moving vehicle or even use reverse thrust to land on a ship’s deck. Bryant said those features would make the Flying Wing not only ideal for security monitoring at the London Olympics but also military operations such as those in mountainous Afghanistan. Compared to other UAVs, Bryant claims the Flying Wing can work more aptly against wind gusts. This is due to the placement of outboard thrusters beyond the wing-tips. ’With this design because we have these fans beyond the wing-tip, we can respond to problematic wind gusts very quickly,’ he said. The Flying Wing is expected to have a maximum flight time of two hours using lithium polymer cells as the power source. VTOL Technologies is currently looking into increasing the endurance by 50 per cent in the next two years with fuel-cell technologies. VTOL Technologies has spent more than eight years designing and prototyping the Flying Wing, but Bryant said further development work will require additional funding. 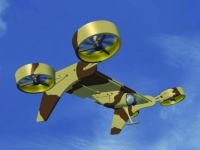 In 2008, VTOL Technologies secured a six-month contract, worth more than £120,000 from the Ministry of Defence’s Centre for Defence Enterprise (CDE). The funding was not renewed last year due to MoD budget cuts. Bryant is still confident he will receive development funding and when that happens it is likely his UAV will be ready for commercial deployment within 18 months. I hope the technology is more original than the name, have they never heard of an aircraft company called Northrop? And what do all the other wings in this world do, swim? There are a plethora of UAVs that one can buy off the shelf with a multitude of imaging and tracking systems to suit a range of budgets. If this were an eco aircraft why not have it as a mini blimp with a hybrid solar-cell and battery arrangement to power the fans and the mission systems? However (as the Manchester police found out earlier this month) it not the technology that wil ground the aircraft, it’s the law. There have been many attempts, both military and civil, that have tried, during the last two and a half decades, to use UAV’s over our the UK that have been “shot down” due to the stringent ruling of the JAA, CAA and now EASA. I believe the concerns lay in uncommanded /uncontrolled flight over residential and other built up areas and close to pilons. What makes that so different from a normal aircraft out of control over a built up area? I don’t know.